It’s easy to get caught up in fashion trends. As fun as they are trends are here today and gone tomorrow. Building your wardrobe around foundational clothing means you you’ll have a closet full of timeless pieces that you can mix and match with trendier clothing and create fashionable outfits work and play. We have all the essentials you need for your closet for women of all sizes and at amazing prices. A black blazer can be the basis of a nice outfit for work or a night out. It’s classic and feminine. The key to picking out the best black blazer is to find the cut that works well with your body type. A little black dress is an absolute must have. You can whip out your LBD for any occasion, any time of the year and look effortlessly chic. With its lightweight and waterproof construction, trench coats look good on everyone. The key to getting the right trench is to buy one that works well with your height. Petite women should get a trench that hits right at or a little above the knee, and tall women need to make sure theirs’ is a long as possible. Pick up a cardigan sweaters in a few basic colors. You can dress them up or down, layer them over a polo or button down, or wear it alone. They look great with skirts and pants too! The silk blouse is a wardrobe MVP. Dress it up dress it down, or wear it to camouflage your midsection. Rock it with our without a jacket over it. However, you choose to wear it you’ll always look pulled together. Whether boot cut, skinny, or flared , you need the a pair of jeans that fit you perfectly. The cut doesn’t matter, what does matter is how they flatter your figure and make you feel on the inside. Speaking of denim, a basic denim jacket with a mid-tone wash works with a multitude of clothing year-round. You can find all of these essentials and much more right here in the JCPenney women's department. Wear distressed or destroyed with a 3/4 sleeve off-the-shoulder blouse for a effortlessly casual outfit perfect for weekends and beach-going vacations. Few outfits are as elegant and versatile as the button-up shirt with pencil skirt combo. Look sharp from the work week to the weekend! Experiment with striking color mixtures such as a white shirt with a red skirt, or a yellow shirt with a black skirt. Mix and match until you find your favorite look! Layering is amazing for almost any situation. Going on a hike? The ability to remove a shell layer when the going gets warm is essential. It's also not just for practicality--layering different articles of clothing can add visual depth and complexity to any outfit, even your favorite! Try combining a simple and comfy blouse with a light cardigan and casual cropped pants for a versatile and always elegant outfit perfect for moving between warm sunny days and cool, breezy evenings! Nothing beats the feeling of wearing a beautiful dress or skirt on a gorgeous day. We've got an amazing assortment, so feel free to choose your favorite style and color. Bodycon dresses are a perennial favorite, as are simple sheath dresses. Go with a sleeveless dress style for the warmer seasons. Put on a lightweight shawl wrap for a boho vibe, then add a striking statement necklace or two to finish off your brand new look! Repurpose your maxi skirts for fall by wearing tights underneath and picking out a fabulous set of of boots. Pencil skirts and a-line skirts are clothing staples that every woman should own. 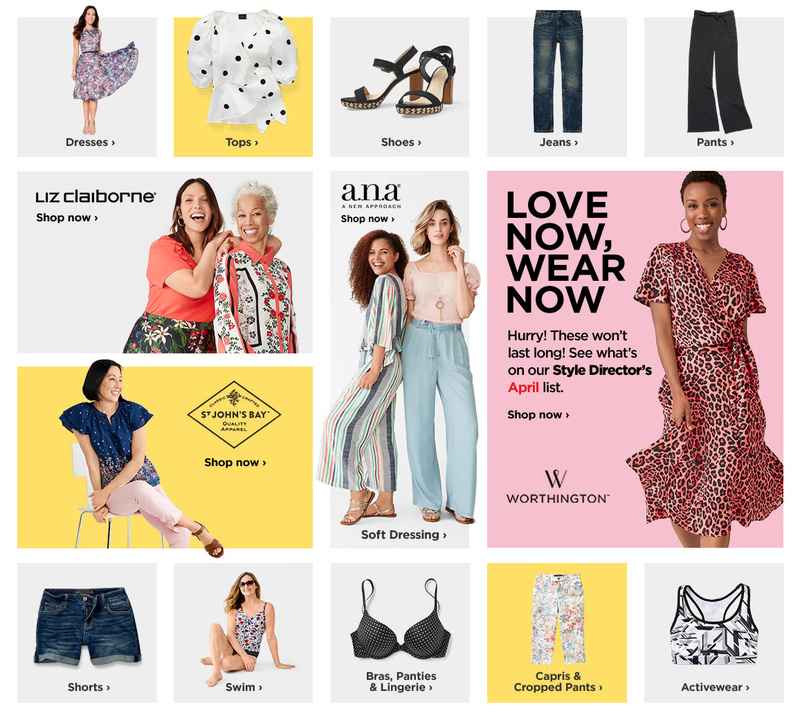 Shop women’s clothes and shoes for women at JCPenney, and stay up to date on the hottest styles.